Most of us dream of a happy marriage. But for many people that’s all it is . . . a dream. Far too many marriages become an ugly world of long faces, sharp words, and bitterness. Have you ever seen a beautiful marriage in which husband and wife live in harmony, caring for each other? Do such marriages exist? Yes, they do, for I have seen them. In a world of bad marriages and broken homes . 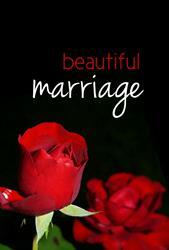 . .
How Can You Have a Beautiful Marriage? At the beginning of time, God made two people, a man and a woman. They enjoyed a beautiful marriage in the garden of Eden. What made that first marriage beautiful? God did. He planned for that first marriage to meet the needs of both partners. He planned for both to be happy and fulfilled. And as long as they followed God’s plan, their marriage was beautiful. In the Bible we find God’s plan for beautiful marriages. God planned marriage to unite two as one. God says, “Therefore shall a man leave his father and his mother, and shall cleave unto his wife: and they shall be one flesh” (Genesis 2:24). God says “a man,” meaning one man. He says “his wife,” meaning one woman. God has planned that marriage would unite only one man with only one woman. God planned that marriage partners be faithful to each other. Of the wife, God says, “If while her husband liveth, she be married to another man, she shall be called an adulteress” (Romans 7:3). And to the husband, God says, “Whosoever looketh on a woman to lust after her hath committed adultery with her already in his heart” (Matthew 5:28). When marriage partners are unfaithful to each other, they mar their marriage with suspicion and guilt. And they will be condemned by God. “Whoremongers . . . shall have their part in the lake which burneth with fire and brimstone” (Revelation 21:8). God planned that marriage partners should love and respect one another. He says, “Husbands, love your wives” (Ephesians 5:25); and, “Wives, submit yourselves unto your own husbands, as unto the Lord” (Ephesians 5:22). God planned for the husband to be the leader in the home and the head of the wife. But rather than being harsh and overbearing with his wife, he should be sacrificial and loving, doing his best to meet her physical, emotional, and spiritual needs. God planned that the wife, in turn, should find rest in her husband’s love and should submit to his leadership. God planned that marriage be permanent. God says, “The woman which hath an husband is bound by the law to her husband so long as he liveth; but if the husband be dead, she is loosed from the law of her husband” (Romans 7:2). A permanent bond joins even the Christian married to a nonchristian. “If any brother hath a wife that believeth not, and she be pleased to dwell with him, let him not put her away. And the woman which hath an husband that believeth not, and if he be pleased to dwell with her, let her not leave him” (1 Corinthians 7:12–13). The marriage bond lasts for life. As long as both partners live, their marriage binds them together. Many people find God’s plan too confining. So they take their own way. A couple loses their love and respect for each other; now only arguments and fights break the cold silence between them. A man divorces his wife because he thinks he would be happier with someone else. A woman slips out with another man while her husband is at work because she feels insecure or thinks that her husband does not love her. Such people are looking for something their marriage does not supply. They have left God’s plan, and go farther and farther away from it while searching for happiness and a beautiful relationship. But have you seen the results of disregarding God’s plan for marriage? Crumbling relationships. Heartbroken partners. Diseased bodies. Neglected children. When you leave God’s plan, you are leaving your only hope for a truly beautiful marriage. God knew what would make a beautiful marriage, and He has a plan that will produce peace, joy, and love in your home. If your marriage is in trouble, seek God’s will and follow His plan, for . . . The problem: An unmarried man and woman live together. They have not committed themselves to an enduring life-long relationship. They want to be free to go and live with someone else when they feel like it. Neither puts much confidence in their relationship, because they know that any little disagreement could destroy it. The trust and closeness that makes a marriage beautiful never grows between them. God’s solution: God says, “Marriage is honourable in all, and the bed undefiled: but whoremongers and adulterers God will judge” (Hebrews 13:4). The couple who lives together Without being married, sins. Such a couple must commit themselves to each other for life by being legally married. God wants every marriage to be stable and permanent. A permanent marriage gives the partners and their children security. It provides an environment in which trust and love can grow. God’s solution: According to God’s plan, there is only one solution. This man must repent of his sin, forsake his immorality, and live in faithfulness to his wife. God says his relationship with others is sin—the sin of adultery. The problem: A wife does not get along with her husband. She says he does not know how to handle their money. She grumbles when he asks her to stay home while he goes shopping. The neighbor lady tells her it is time to sue for divorce. God’s solution: According to God’s plan, marriage endures for life. So divorce is not the solution. God says: “Wives, be in subjection to your own husbands; that, if any obey not the word, they also may without the word be won by the conversation of the wives” (1 Peter 3:1). The problem: A husband is irritated when dinner is not ready on time. (His wife has been tending the sick baby.) He snaps at the children when they quarrel. When he is with his family, he is nearly always tense and unpleasant. God’s solution: “Husbands, love your wives, even as Christ also loved the church, and gave himself for it” (Ephesians 5:25). In a beautiful marriage, the husband gives himself for his wife and family. He helps with household chores as the need arises. He gives of his time to teach and discipline the children. He sees his family’s needs as more important than his own. Following God ’s will brings great satisfaction and joy. Even so, your past failures, or the past or present failures of your spouse, may continue to taint the beauty of your marriage. But as you commit your life to God, He will give you grace to follow His will for your marriage. As you follow it, your marriage will be to His glory. And a marriage that glorifies God is a beautiful marriage.